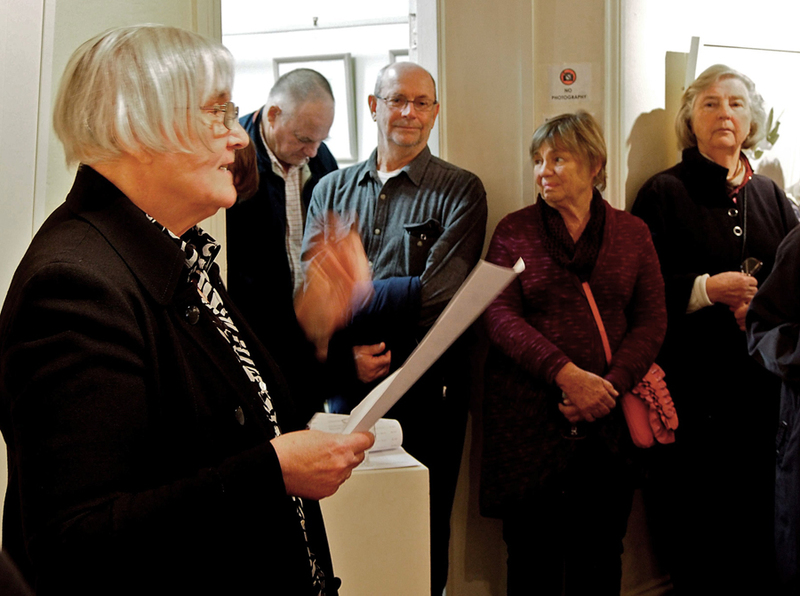 I’d like to welcome you here and say that it is a pleasure and privilege to be asked to speak at this exhibition of work by Judy Morris and Ian Gibbins; also I’d like to thank the Hahndorf Academy for continuing to offer the good work of giving artists the fresh air of opportunity that the rustle of encouragement brings. But most of all I want to applaud Judy Morris and Ian Gibbins for creating, just for our enjoyment, a collection of drawing and poetry that offers us the full blooded and uncompromised pleasure of both a feast for the eyes and food for thought. Because… not only are there two artists here, a happy situation we are confidently used to, but we are also being treated to two genres, or types, of creativity. About drawing…I’ve heard people referring to drawing as the naked truth, and I have supposed that to be a romantic way of saying that all the marks show. About poetry…I learnt at school that poetry is about patterns of words, and that it’s made of lines not sentences, and I now know that our verb to create comes from the ancient Greek word for poet, and so the concept of the poet as creator is ancient…so I understand poetry as the primary verbal skill of literary creation. As a young historian I realised that making drawings and making poems are two of the oldest seriously sophisticated, complex, descriptive and intentionally researched professional activities of humanity. Both activities are fundamental to civilization. I believe that if we could go far enough back in time we would meet the person who first said with authority and a piece of red ochre in her hand ‘Look I’ll show you’ and her partner who said, in patterns of words ‘Listen and I’ll tell you’. Judy Morris and Ian Gibbins are both modern scientists, until 2005 Judy was associate professor and research fellow at Flinders University Centre for neuro science, Ian Gibbons until recently has been Professor of Anatomy and Histology, and they are also inheritors and practitioners of the ancient arts of drawing and poetry. Judy had the bred in the bone advantage of a father who could draw, but even if Judy’s meticulous drawing style was embedded in her DNA, she still had to find it; happily for us she did, and drawing supported her ability to see the microscopic structures and functions of nerve cells which is, as you might guess, a job where detail matters; Judy has said that the close scrutiny of the flowers allows her to reimagine them as subjects, and to capture in graphite and coloured pencil images of her experience of seeing the flowers, of being with the flowers, of responding to the flowers. Judy says she only comes to see them fully through drawing them. How does she do this? Judy sets up her subject, a flower, a leaf, a piece of the world, and studies it with a macro camera, so she gets a more or less microscopic view of her subject and then, or so it seems to my eyes, she intertwines and overlays through the drawing those details within the flowers that elude the unaided eye; in her drawings I sense the smells, the down on the leaves and petals, the sturdiness of the stalks and stems, the haze of perfume. 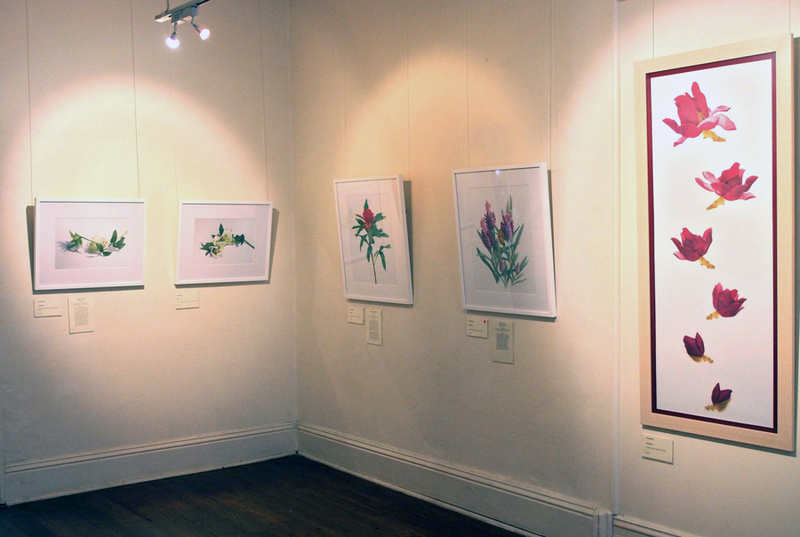 Judy’s drawings here on the walls are not purely botanical, they are dynamically detailed and intelligent responses to life, made from the deep decisions of articulating her materials with her source, of energising her coloured pencils and graphite with the ancient abundance of Flora. Ian Gibbins is a poet and as he is also a musician I can surmise that he too has the felicity of some aural sensibility embedded in his DNA, and despite Shakespeare’s assertions, the poet doesn’t create out of “nothing” and make a world out of air, the poet always has something to say, something to explore. When I read Ian’s poems I was startled by the joyful experience of my hair lifting from my scalp. I scuttled into the words and stayed there for a while, jumping back and forth from Ian’s poems to Judy’s drawings. Deep scrutiny of the botanical names of Judy’s subject Flora were the start of Ian’s delicious journey, which I followed, looking through the glass over the drawings and through the words of the poems, it’s a trip worth taking, to go back and forth reading the poems to the listening drawings. And furthermore Ian has given us these poems, here in this book Ian has given us a treasure to take home, to read and read again. 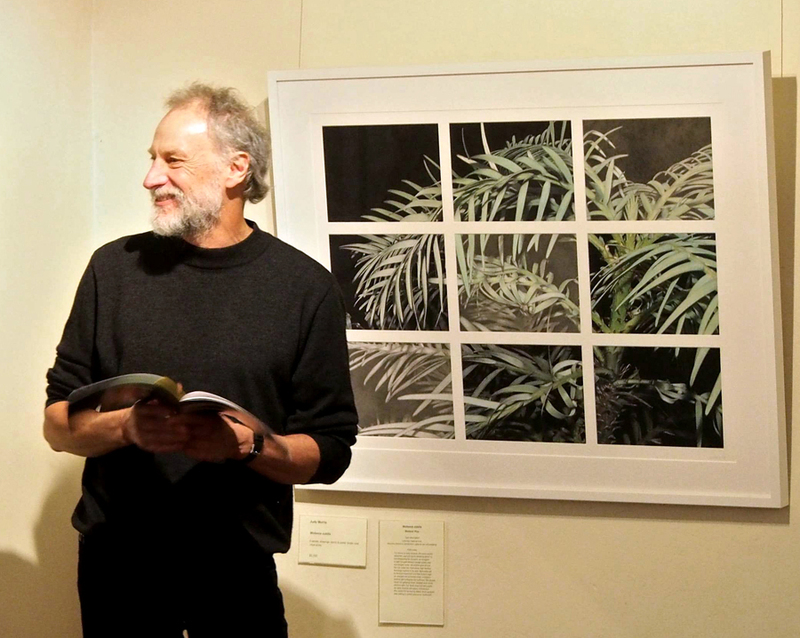 All types of art are hard work, and Judy and Ian have worked intelligently, courageously and imaginatively to describe, for us, the unbidden and fleeting intimations of another level of being…just so that you can see and read what you will. Poetry like drawing has been with us forever, drawing like poetry is forever the same and never the same, every new drawing, every new poem, is just that, it is new, it is a renewal of the ancient human genre. So let us applaud these two artists. ** Shakespeare A Midsummer Night’s Dream: Act 5, scene 1. 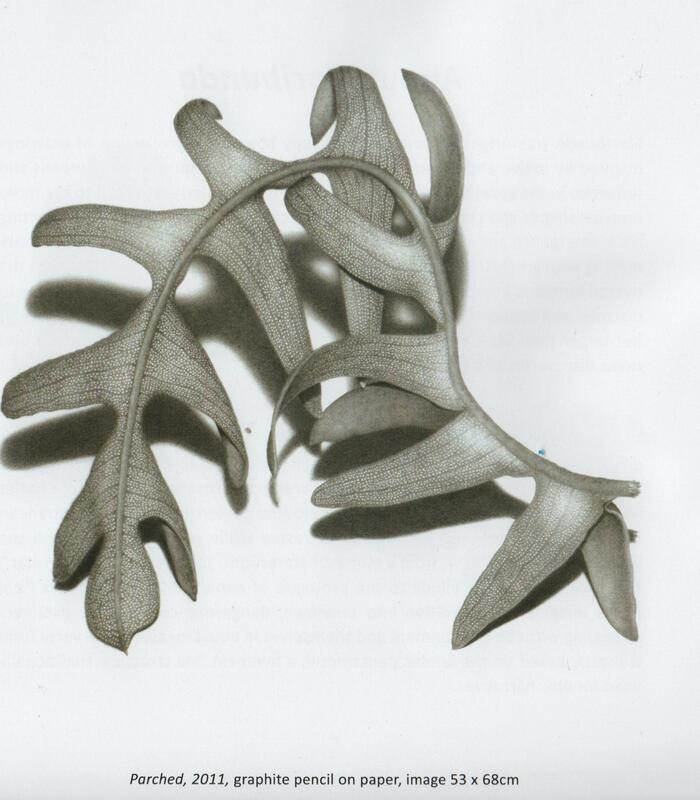 Maureen Gordon studied and exhibited sculpture and painting in England before marrying the Australian painter Jeremy Gordon and moving to Australia where she taught art history and theory at the University of South Australia, The SA School of Art and at Flinders Uni as adjunct. 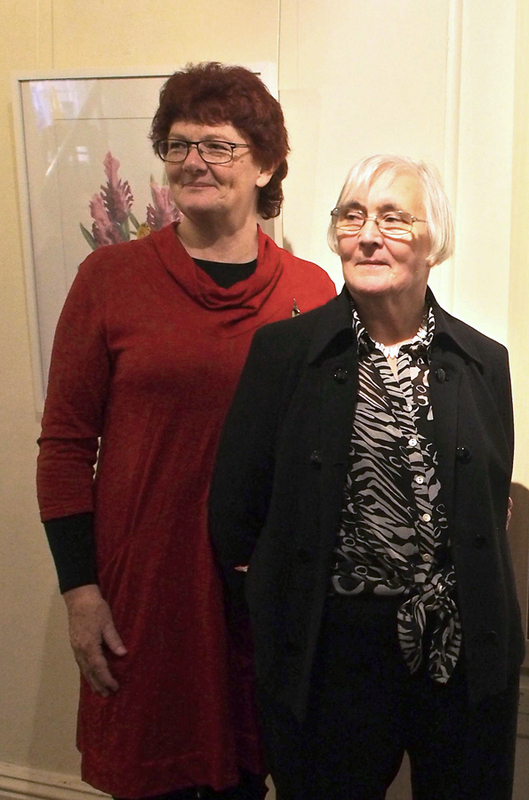 She was head of Art History and Theory at The Adelaide Central School of Art. In retirement she writes and gives workshops on ancient and medieval materials and techniques. 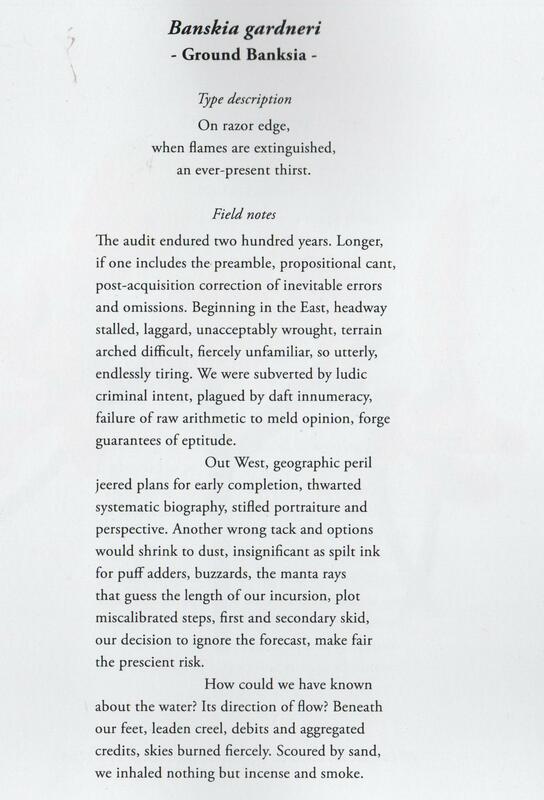 This entry was posted in Floribunda, Hahndorf Academy Gallery, Ian Gibbins, Issue 14, Judy Morris, Maureen Gordon and tagged Australian Art, Australian poetry, Flora, poetry, Science, Visual Arts by Mark Roberts. Bookmark the permalink.